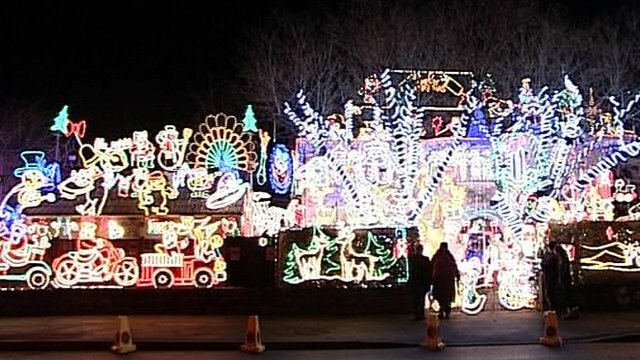 Christmas home's 180,000 light bulbs Jump to media player One Wiltshire family turns their home into a 180,000 bulb Christmas display. Home turned into Christmas light show Jump to media player An electrician from Melksham in Wiltshire has covered his house in Christmas lights to raise money for the hospice which cared for his mother. A Wiltshire electrician has transformed his modest home into the ultimate Christmas illuminations extravaganza. 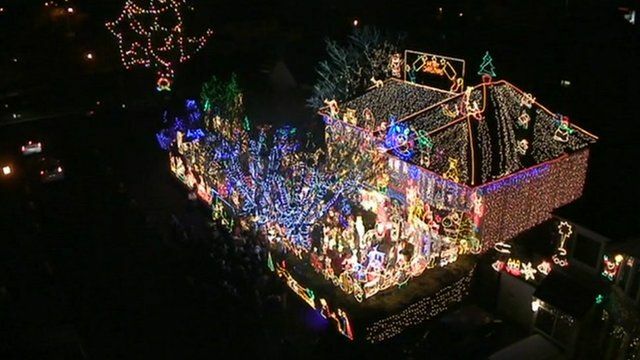 Alex Goodhind, from Melksham, spent five weeks and installed three separate electricity supplies to illuminate the house. The display uses 180,000 light bulbs and is estimated to cost about £1,200 over four weeks.